Because both versions of this theme are very popular with our customers, we decided to create a third WordPress version of this Online Radio Station Template. In this article, we have explained thoroughly everything regarding creating a radio station with minimal expenses or a real, certain budgeted, radio studio broadcasting on a specified radius. As mentioned in the blog article, this theme is created in WordPress CMS system. Now we wouldn’t want to bore you with detailed explanations of CMS, but we’ll tell all of our inexperienced users that CMS stands for Content Management System. The most important thing to consider here is that one DOES NOT require special knowledge or experience for any theme created with this system, anyone can manage the website: alter texts, upload images, create pages, categories, blogs, post articles in that blog, allow customers to leave comments. So to be brief, almost anything is possible with the WordPress system, which is exactly why we decided to create our most popular radio theme in this system. We would also like to state that WordPress is an open source system, which basically means it’s open for any programmer to alter the site, creating special plugins to functionally enrich your website. WordPress plugins are functionally diverse. Below Gridgum will list a few of them, so you understand the meaning better. UpdraftPlus WordPress: With the help of this plugin, you will be able to easily create a back-up of the website, thus protecting yourself from the server’s unwanted surprises. WooCommerce – The most widespread plugin, which gives your website the functions of an online store. With the help of this plugin, your website will gain all necessary functions that an online shopping website needs, for instance, something like a working shopping cart and so on. 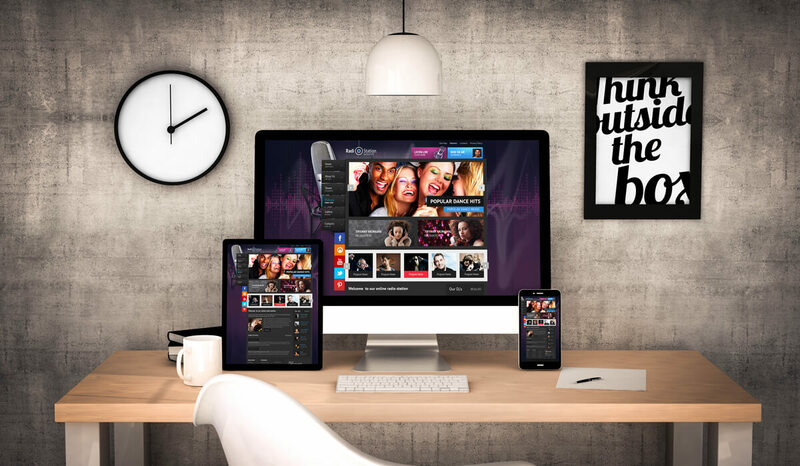 And finally, you may ask yourself: Why buy Gridgum’s WordPress radio theme? How is it different from any other provider’s themes? We won’t insist that this is the best design there is, that’s for you to decide, but we can tell you this and be proud of the fact, that no one will be able to find support and instructions like ours. We have a special agreement with authors of our templates or themes, obligating them to provide any amount of video tutorials for our customers quickly. This kind of comforts our buyers, because if you can’t understand something, there’s nothing to worry about. We are taking responsibility for providing you with the best step-by-step instructions for life, however many times and however long it may take. Ask any desired questions in the comments section above and you’ll get a video guide within a day. 1. 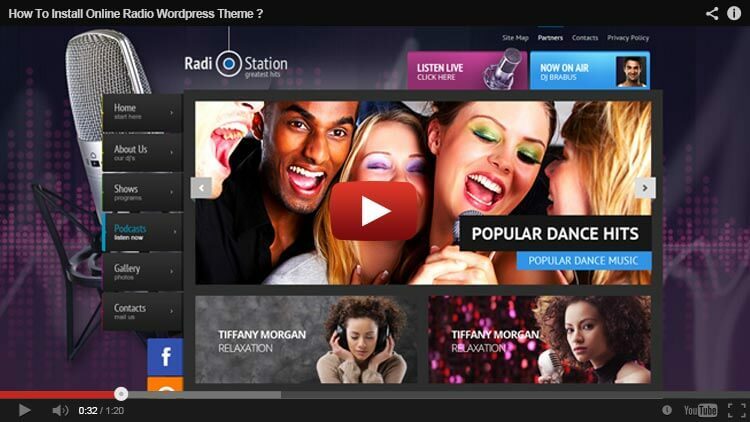 HOW TO INSTALL ONLINE RADIO WORDPRESS THEME BY DUPLICATOR ? 2. HOW TO CREATE MySQL BASE WITH USER ? 3. HOW TO INSTALL THEME ? 4. HOW TO CHECK IMAGE SIZES ? cPanel login details has been emailed to sale@downloads-templates.com Please install the theme with demo data (all the picture, features, player etc), it will be helpful for me to change accordingly. Player also purchased by me and transaction id sent to you. Payment cleared. i am willing to pay, Thanks. will you start doing now? Please let me know your paypal address to pay as well. Sir, I am sure you are not in denial of support, I have followed your video like the bible. Please see the issue. Thanks. i have seen thrice your tutorials, i believed followed accordingly step by step by making a written note, am i still missing something!? CSS.STYLESHEET missing! will you help me, please? Dear Support Team, I am trying to install the theme but after numerous time effort i am having the following message, Please look into the issues. Thanks. Installing Theme from uploaded file: standard-installation-package.zip Unpacking the package… Installing the theme… The package could not be installed. The theme is missing the style.css stylesheet. Theme installation failed. hello,my client has bought this theme but in his folder,He don't have "installer.php". Can you help me please ? Dear customer, please click the above the yellow button "Video Tutorial", see video guides on how to install this template and follow, what is the problem? Georges,I watched your video tutorial and in the first video you have a file : "installer.php".But I don't have this file. My zip folder is "300111771.zip" and when I unzip this folders I have one folder (300111771) and in this folder I have seven folders (Database,documentation,font,plugin,psd,theme and uploads).I don't find "Installation package by Duplicator.zip" or "installation package"